I left San Jose in the early morning, heading out on the start of another road trip, visiting a variety of places, not just desert summits this time. 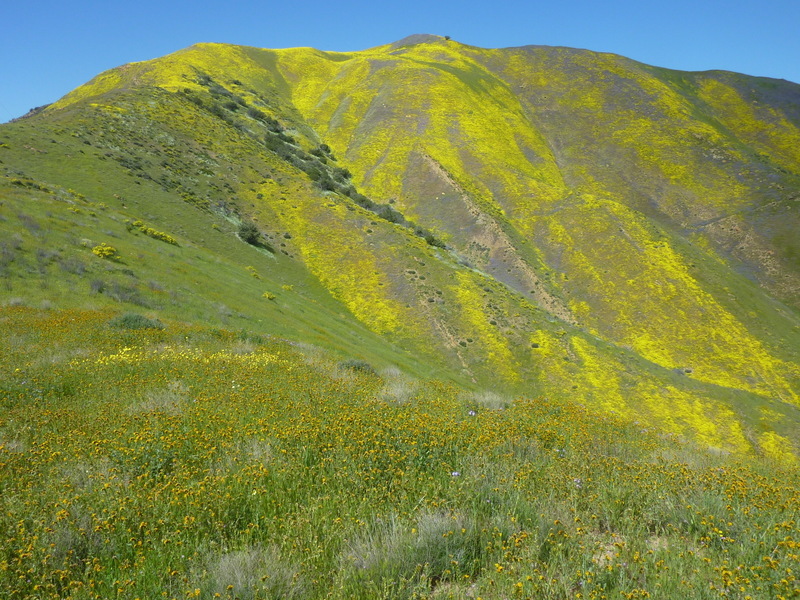 I planned to spend several days in the Carrizo Plain National Monument, taking in Spring wildflowers on display there. The national monument is a vast tract of land managed by the BLM, encompassing most of the Carrizo and Elkhorn Plains, along with much of the Caliente and Temblor Ranges on either side. There are also state lands on the west side managed as a wildlife reserve with limited access. Soda Lake Rd is the main thoroughfare running through the monument, much of it paved but with a dirt/gravel section in the middle (suitable for all vehicles). There are various roads forking off that can be used to access peaks in the Caliente Range to the south and the Temblor Range to the north. Soda Lake Rd can be reached from SR58 to the north (which I used coming from US101) or from SR166 to the south. These two summits are located in a small collection of hills in the northwest corner of the monument. The second summit is actually outside the monument on private lands. I parked at the top of a saddle on the east end of these hills, accessed by a very steep spur road suitable only for 4WD. This was really just for fun - parking at the base of the hill would have added little to the hiking effort. The hills were fairly covered in bright yellow flowers that made for a striking introduction to the area as I drove south on Soda Lake Rd. There are no trails here, save for a use trail that I used to start on from the saddle, but it soon petered out along the steep, flower-covered slopes it followed along. I made my way up to the crest where I had a very nice hike along the undulating ridgeline, taking in fine views off both sides. I did my best to avoid trampling the flowers, but in places there were just so many that it was impossible not to find some under my boots from time to time. It took about 45min to make my way to the higher Peak 2,896ft. There is a great view to the northeast of California Valley (a rural community in the northern part of the Carrizo Plain) carpeted in yellow for many miles. To the northwest could be seen Peak 2,786ft another 1.4mi away. I hadn't planned to visit it, but the hiking and views were so enjoyable that I decided on a whim to continue in that direction for the second summit. Along the way I went over a barbed-wire fence (marking the boundary of the BLM lands), taking another 45min to get from one summit to the other. Though the grass was tall and lush, I saw no cattle anywhere today. The summit of Peak 2,786ft had a solar array and a trio of instruments that looked like a telecom relay setup. Rather than return the way I'd come, I decided to drop down into California Valley and hike the roads back to the start as a way to save some time. I went down an easy ridge to the northeast featuring bushy lupine, adding some additional color to the scene. The hike along the roads in California Valley go by a collection of dispersed homesteads, some abandoned, others roughly maintained. Most of the walk was quiet and uneventful, though some barking dogs added a bit of annoyance. One property had eight dogs that came out to give me an earful, but luckily the fence around the property was sufficient to keep them contained. Not so, the adjacent property. That one had three dogs, two of which had little trouble getting through the fence. The owner came out to call his dogs back, but they paid him little attention. I had walked several hundred yards past the home when one of the dogs decided he hadn't given me enough trouble and began running after me, snarling menacingly, his owner's calls unheeded. I unzipped the top of my pack, pulled out my pocketknife and opened the largest blade, only a few inches in length, and held it out in my hand as the dog approached. This was a fairly good-sized dog that could easily take me down with a leap. I had no real idea what a dogfight would look like, but I figured I'd shove my pack in his face with one hand while I jabbed the knife into his belly with the other. Even while the dog was running at me I recognized I might get pretty chewed up and there was going to be little recourse in suing the owner who probably had a networth around a few thousand dollars. Luckily I didn't have to find these things out - the dog stopped about 30ft short of me, snarled nastily, and then sauntered back home. After watching it continue for some distance, I put my knife away and went on my way, thinking maybe I should carry something a little more threatening, like a Bowie knife. I finished up the 7-mile loop in something under 3hrs with a final climb back up to the saddle where I'd parked. This is a very popular viewpoint overlooking Soda Lake on its western shore. The lake has no outlet and can get seasonally large as it was today. Found just off Soda lake Rd, it's a short hike from the parking lot to the top of the rounded hill. There were many dozens of folks crawling over the small hill to take photos of the views and flowers underfoot, so many that I really just wanted to get out of there. And this was on a Tuesday - I can only imagine what it looks like on the weekend. After extracting myself from Overlook Hill, I headed south, intending my next stop to be Painted Rock, another popular spot to visit, though this one with an actual hike. I found the Visitor Center closed, though the parking lot there was nearly full with folks picnicing about the grounds. The road to Painted Rock was closed just past the Visitor Center, after which I found it to be closed until Jun or July for nesting season. Back out at Soda Lake Rd, I continued south to the end of the pavement, and then more miles to an unsigned right spur road. This road leads to the old Wells Ranch location and then higher into the Caliente Range. The road passes through a saddle on the crest of the range at the head of Wells Canyon just above 3,000ft in elevation. I parked at this saddle shortly before 3p. This is what I had come to see - I was almost six miles from the main road, incredible wildflowers on display, and the place virtually to myself - I wouldn't see another person or vehicle the rest of the day. There were six summit in the area that I hoped to visit. Because of the lateness of the day I would only get to the first five, but they made for a fantastic loop. Unlike other coast ranges that are thick with chaparral, the Caliente Range, particularly the lower southeast half I found myself in, had almost no chaparral at all. The cross-country hiking here is easy and very enjoyable at the right time of year (it can be dreadfully hot here in summer). The first summit I visited was along the main crest of the range, about a mile and a half from the starting point with only a modest amount of elevation gain. The fields of yellow flowers were incredibly dense in places looking northeast towards the Carrizo Plain. To the southwest, could be seen the colorful hills I would climb next, behind them the Cuyama Valley and behind that the much higher Sierra Madre Mountains of Santa Barbara County. From the summit of the first peak, I followed a connecting ridgeline to Peak 3,375ft and Peak 3,448ft, in turn. There was an old barbed-wire fenceline along portions of this ridgeline that proved handy to use as a handline where the ridge was exceptionally steep. The last two summits took considerably more work as I had to make my way down into a deep canyon before climbing back up to the summit. Between Peak 3,448ft and Peak 3,284ft I had to drop into Wells Canyon. I actually started off in the wrong direction, descending northwest when I should have been heading west. I was aiming for the wrong point and it wasn't until some time later I realized my error. I ended up climbing into and out of two branches of Wells Canyon before making my way up the East Ridge of Peak 3,284ft. Not learning my lesson well, I made a very similar mistake in descending into Middle Canyon, heading northwest when I should have again been heading west. Middle Canyon was particularly deep, but I was helped by the presence of an old ranch road (not shown on the topo map) that traversed the east side of the canyon to make things easier. It was after 7p and very nearly sunset by the time I reached the fifth summit, Peak 3,402ft. It was here that I realized the sixth summit was several miles off across yet another drainage, Horse Canyon. To continue on would be to do most of it in the dark and since I was here to see wildflowers, not my headlamp beam in front me, I decided to leave it for the morrow. I descended to the northeast off Peak 3,402ft into the upper part of Middle Canyon where I found a road (this one was expected) to take me back to my starting point sometime after 7:30p. The 3.5hr hike was one of the nicest ones of the year, certainly the most colorful. I showered and spent the night at the same saddle I'd parked at, moving the jeep only so that I could find a flatter spot for sleeping. A most lovely day!